Well, I've just done something I've wanted to do for a long time: I became a sister: Hi all you other sisters! So, a bit about me: I'm a 40 something, married with a 7 yr old son. We are British but moved to Brittany (NW France) about 18 months ago to live the good life and spend more time with our son. We had got to that stage where we were spending all our time working and doing little else. We bought our tiny house here 4 years ago as a holiday home and found we loved being here so much we made it permanent. One of the things I was missing was crafting. 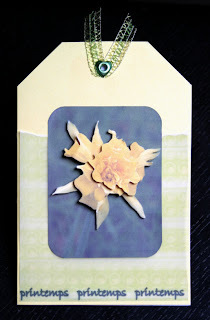 I have dabbled at different times in all sorts of crafting: knitting, jewellery-making, cross-stitch ...It is card-making that has spanned the years and I returned to when I had more time. Time is still precious though: We are still renovating the house and growing nearly all our own fruit and veg and, as we are vegetarian, that's quite a tall order! I am now in the process of setting up a craft business here whilst trying to improve my French at the same time. I intend to make my blog bi-lingual when I'm feeling brave enough! Funky Fairy's new collection is 'Do ya Doodle' and it's a really versatile set of papers so I have used these with this week's challenge "to create anything involving a tag: Create a tag, something tag-shaped or including one or more tags, and your tags can be any shape or size." I have lots more ideas but it is school hols here and I started the long-awaited course to improve my French today so finding time is especially hard! 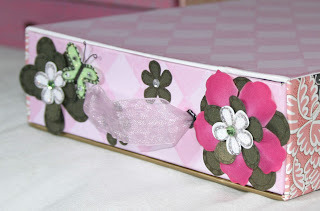 I LOVE my new look box file. Needed to keep it practical but think the paper is fab and really adds colour to my desk so a few more are going to get that treatment esp as it only took seconds to do! 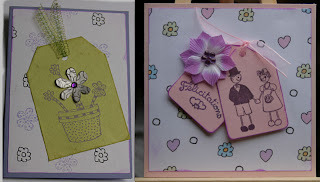 All papers in this post: Funky Fairy 'Do ya Doodle'; label on box file from FF 'Pinkie Pops'; Stamps on backing and tag of the flowerpot card are from the FF 'Doodles for Daniel' collection, Other stamps: wedding couple by Aladine, text stamp make unknown . 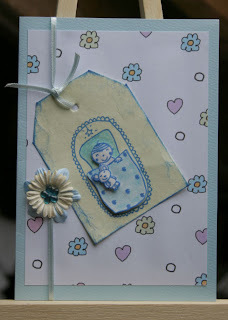 Baby stamp by Aladine stamped 3 times and decoupaged. While this is definitely one of those where the photo doesn't do the card justice (colours have gone weird) I got a challenge hatrick : It is another for the Funky Fairy challenge as below, it also is for the Scrummy Stash Café "we challenge you to create a project that is focussed on just one shape" AND it is green for the Arty Girlz challenge. I have used square card blank with Funky Fairy square patterned paper from the Cool Coordinates collection with my square cropped photos and, with more from yesterday's purchases, square brads from Artemis and square-patterned ribbon. The peel-off (french equivalent of get well soon and also bought yesterday) is coloured strong green but looks weird in the flash. Louise's challenge this week: For this weeks challenge I would like you to make a card, scrapbook page or brag book etc etc - around one photo or a small collection of photos (all of a similar theme). There must also be at least one piece of text / saying / phrase included in the project. With "Mother's Day" and "Easter" around the corner, this could be the perfect opportunity to make that aaaaaaaaahhhhhhhh card / project ! ! 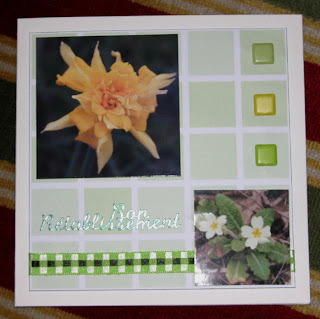 Alternatively use your photo on a "Retirement", "Wedding" or "Birthday" card / project - the possibilities are endless !!! I took my camera out and photographed the daffodils and primula growing wild in the field. This is my first creation as I also followed the Cartes Maniak sketch for last week in making it but was too late for their deadline last night. Only excuse was that I was out all afternoon at a craft fair spending money and adding to my stash! This card uses Funky Fairy cool coordinates printed on vellum with text overprinted and my photo decoupaged. 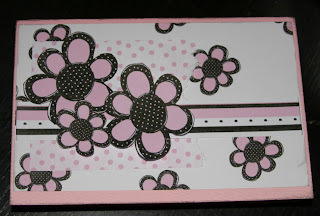 Used ribbon and corner punch from my new stash too. 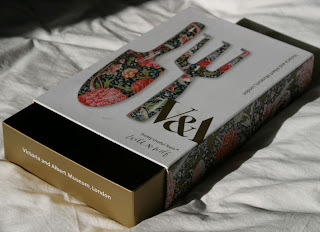 I know that's an unlikely combination but this week's FF challenge was to alter somthing for storage and I had this great Christmas pressie of William Morris trowel and fork which I have put to use this week and decided the box sooooo needed to be kept especially as the drawer is plain gold inside and I need somewhere to keep my growing collection of cuttlebug dies and folders. Also decided that I wanted to keep the WM pattern on the sides so used some Funky Fairy Cool Coordinates paper and stamped flowers with the Doodles for Daniel collection stamps. 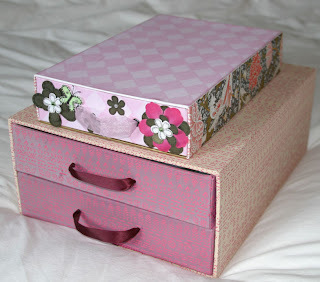 Added a Papermania fabric flower and some gems and I now have another drawer to add to my collection. I made the double drawers it is resting on from scratch at a craft class nearly a year ago - 3mm thick card, paper taped seams and covered the lot inside and out with paper - and it has had a lot of use. I might now decorate more to match. As both challenges involve tearing paper I have combined the two, following the sketch for Cartes Maniak and using Funky Fairy papers. 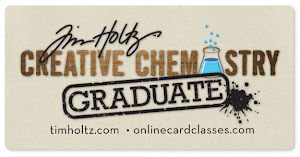 I have submitted the Cartes Maniak one just inside the 9pm deadline tonight but you have until Sunday if you want to join in on the Funky Fairy one - see link to the right. It is the only (and rushed) bit of crafting I've managed to get done this week after altering the CDs below over the weekend and I have withdrawal symptoms. These started as 3 unwanted CDs. I drilled a hole through, covered them in paper, using permanent pen to colour the edges, and then decorated them for my sister's 40th birthday: A little keepsake. First time I have altered CDs: What do you think? The papers used are a combination of my own designs (front and back covers), K& Co (5th side) and DCWV (2nd and 4th sides). Also used Funky Fairy 'Doodles for Daniel' flower stamps with white brilliance ink pad to create a backing from plain paper and to decorate the 3rd side and the 'Love' stamp with Whispers Azure pad to decorate the last side. I've been tagged by 5 people for this - Thanks girls!!! Each fact must begin with that letter. If you don't have a middle name, just use your maiden name. At the end of your post, you need to tag one person for each letter of your middle name. I - Installation d'entreprise: That's the name of the course I am on all this week: It's compulsory if you want to start a business of any size in France and it's tough going even for those who are fluent in the language, and I'm not! D - Designing: Love it! A - Artistic? I like that others think I am but it's not how I would describe myself and I really envy those people who can just pick up a pencil or paintbrush and create something great. Could have Anglais: There's no doubting that I'm English despite living in France but many French call my husband that to be firmly told he's gallois (Welsh)! Who do I know who hasn't been tagged with this? If that's you - How did you escape? - Consider yourself tagged!